Volcanoes erupt in different styles from flowing rivers of lava in Hawaii to dramatic and violent explosions on Montserrat. So how do volcanoes erupt? and Why can the eruptions be so different? 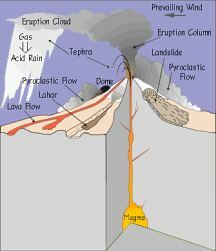 Volcanoes have different eruption styles caused by magma type and explosivity.Hawaiian style is rivers of flowing lava and lava fountains.Plinian,Pelean volcanic eruptions produce towering explosive clouds of ash and pyroclastic flows.Strombolian spectacular lava fireworks,Surtseyan eruptions explode out of the sea and Vulcanian explodes black then white ash clouds. Eruptions can be effusive with flowing rivers of lava or (gentle) or explosive with rapidly occuring eruptions which generate large volumes of ash. Fluid lava eruptions tend to be more effusive with some lava fountains and are generaly found in hot spot or rifting settings. The rock type erupted here is normally basalt which is sourced from the mantle. Occasionally basalt will be erupted in subduction zone settings ie. Stromboli and Etna. In this situation the magma will have ben injected into the base of the volcanic system from the mantle and had little chance to pond in a magma chammber before erupting. Lava fountains can occur. Explosive eruptions tend to occur at subduction zones where lava is more viscous and contains more gas and steam. As magma rises within the crust its chemical composoition changes. Silica is added from the surrounding crust which makes it more viscous, water and gas form bubbles .Within the magma chamber the melt cools and starts to crystallise making it less fluid. All this stickiness makes for an explosive mix-bit like blowing bubbles in thick milk shake! Exceptions are where hotspots occur under continental crust which cause giant caldera forming volcanoes or supervolcanoes. Supervolcanoes put other eruptions in the shade. They erupt incredibly violently for days on end and change the climate of the whole world by filling the atmosphere with ash and dust. We don't want one to go off.